Buying a house differs from renting an apartment in small and large ways. On one hand, you get to give up listening to the people across the hall scream at the television. On the other, you have to actually pony up the money yourself when something breaks. And things will break. Usually when you least expect it. This is an especially harsh realization if you're a first-time homeowner. There is always a learning curve when it comes to handling the quirks of a home. So, it's important to know what you're getting before you buy your new house. This starts with hiring a licensed home inspector to check out the home you want to buy. This person works for you - not the home seller - so don't be afraid of asking detailed questions about the house. This person should check the entire house - plumbing, electrical, insulation, and more - to ensure is up to code, as well as sharing the life cycle of the important parts of the home like the roof, the water heater, and more. 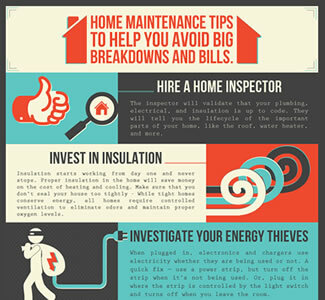 Make sure your home inspector have errors and omissions insurance. 1. Insulation is the best money you will ever spend. Insulation starts working from the first day it's installed and never stops. Proper insulation in the home will save money on the cost of heating and cooling. If wood is exposed on the horizontal trusses or roof members in the attic chances are it needs insulation added. Insulation goes hand-in-hand with a good air quality system. While tight homes conserve energy, all homes require controlled ventilation to eliminate odors and maintain proper oxygen levels. 2. Investigate all of your energy thieves. Understand where your energy goes. When plugged in, electronics and chargers use electricity whether they are being used or not. We recommend plugging in several devices into one power strip and then turning off the strip when it's not being used. You can also purchase "smart" power strips that allow you to turn off some plugs while keeping others powered - all from a smartphone app. 3. Maintain your appliances and mechanical systems. Have you ever vacuumed your refrigerator coils? Most people don't, but a dirty coil won't transfer heat because the dirt acts as an insulator. Cleaning coils once a year and changing filters on your HVAC every 3 months (or sooner!) are two simple tasks you can complete to make your home run more efficiently. We also recommended that you hire licensed professionals to inspect and clean your HVAC system and air ducts annually. 4. Make sure the humidity in your home is in the proper range. If the humidity is too high or low, it can cause damage to the home and its contents. Humidity control is also important for controlling indoor allergens and bacteria. While the best humidity setting for your home does depend upon the season and your location on the globe, a general recommended setting is between 30 and 50 percent relative humidity. Newer thermostats can help regulate the humidity in a home year-round. 5. Keep it clean and dry. The National Association of Home Builders says homeowners should pay careful attention to cleanliness in all aspects of a residence. According to the NAHB, if you allow dust and dirt to accumulate, it can harm the finishes on blinds, cabinets, counter tops, floors, sinks, tubs, toilets, walls, tiles, and other items. If dirt does build up, make sure to clean it with a substance that does not scratch or damage the finishes. You should also replace the filters in your heating and air conditioning systems to make sure they are clean and unobstructed. At minimum, you should replace your filter every three months. The outside of your house should be checked on a regular basis to make sure that gutters and downspouts aren't clogged, window sills are caulked' and the errant sprinkler isn't showering your home. For more information on complete home protection that fills in the gap left by your homeowners insurance, call Home Warranty of America, part of the Direct Energy family of companies, at 1-888-492-7359 or click here.